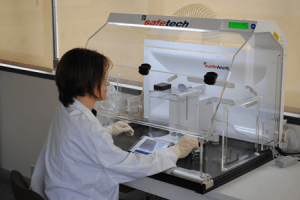 ST1 Safe Weighing Enclosures and Cabinets. Personal safe weighing is of special importance when weighing potent substances. This is where the ST1 series safe weighing enclosures offers optimum conditions for people and material. The unique functionality in the design enables the uninterrupted operation of sensitive micro analytical scales and ensures the minimum weight. The a1-safetech safe weighing enclosures creates security and the best weighing conditions possible. It is recommended by all the leading scale manufacturers and used by many in the pharmaceutical and chemical industries based compagnies. The safe weighing enclosures are designed to protect the user during the weighing process. They guarantee the weighing stability even when weighing in the microgram range, and optimally protect the user throughout the entire weighing process.